Hailing from Richmond, Virginia, Jason White won six Virginia karting titles in five years. He then rose the NASCAR national series. He raced in the Xfinity Series from 1999 to 2014. He also raced in the Truck Series from 2001 to 2014. He had two Cup starts in 2011 and 2012. While he had some success in the Truck Series, he didn’t have any in the Xfinity Series. 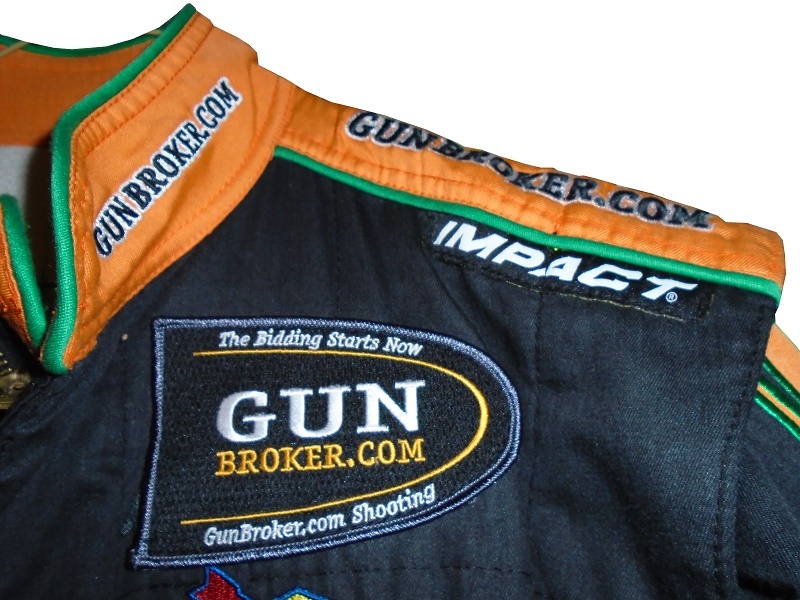 Jason’s success in the Truck Series came with Gun Broker as a sponsor. In 2011, White raced for Joe Denette Motorsports he had 2 top 5’s, and 5 top 10’s. In 2012, White left JDM and founded in his own team. He repeated the stats from 2011, 2 top 5’s, and 5 top 10’s. During that time, he wore this Impact! driver suit. The suit shows decent use. 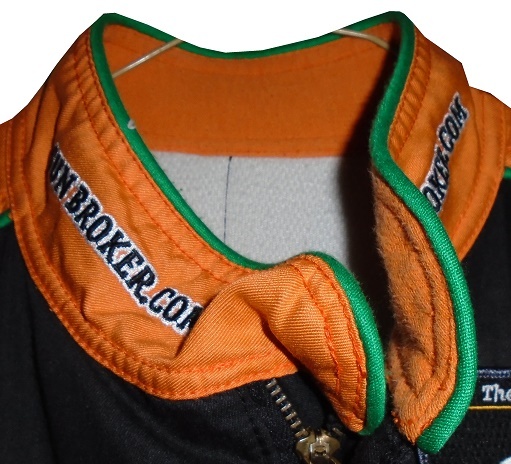 The orange collar is the standard variety, and has GUNBROKER.COM logos embroidered. The cowl doesn’t have a tag. 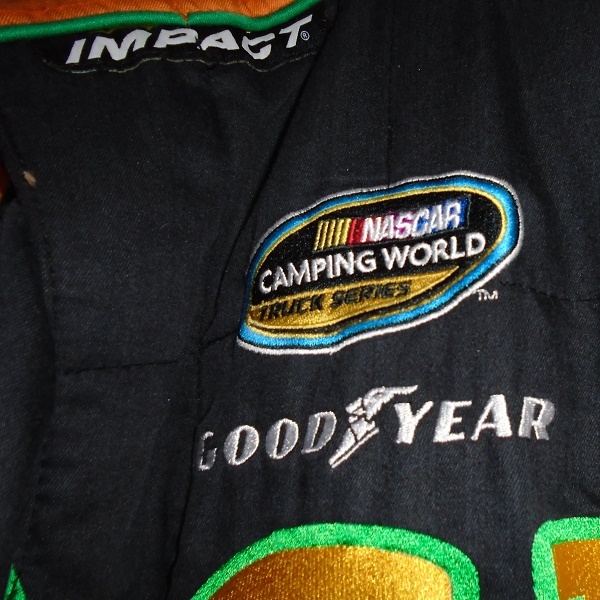 The right chest has NASCAR CAMPING WORLD TRUCK SERIES, and GOODYEAR logos embroidered. 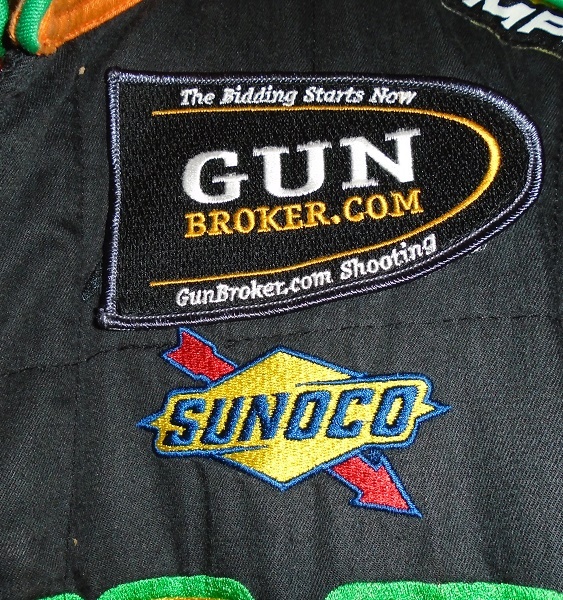 The left chest features a GUNBROKER.COM patch, which covers the Joe Denette Motorsports logo from 2011. That dates the suit to 2011 and 2012. There is a SUNOCO logo below the patch. 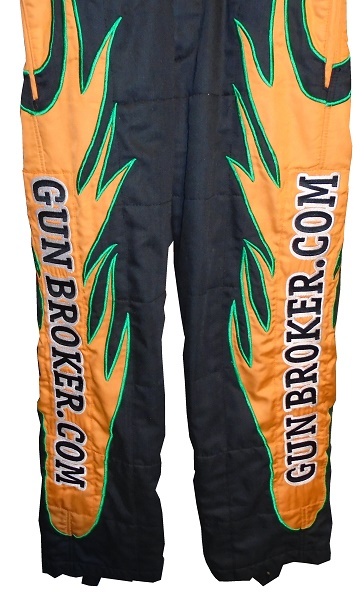 The front torso features a yellow and green GUN BROKER logo embroidered on the black material. 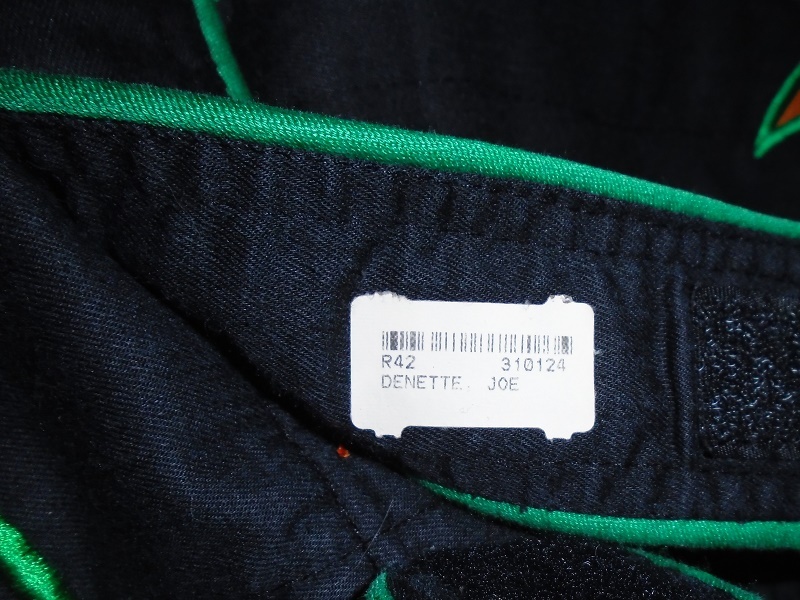 The Impact Warranty label is inside the zipper under the logo. 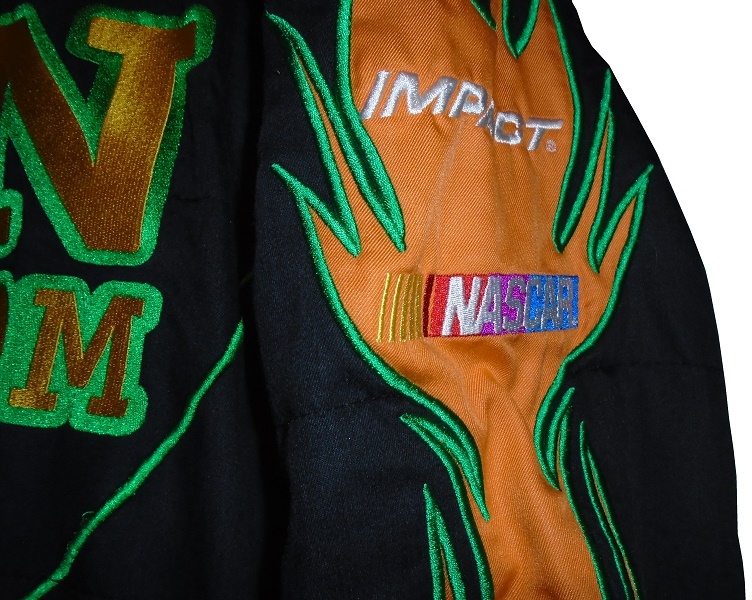 The belt is black with orange borders, with JASON WHITE embroidered in white in the center. There is a Joe Denette Motorsports sticker on the inside of the belt. 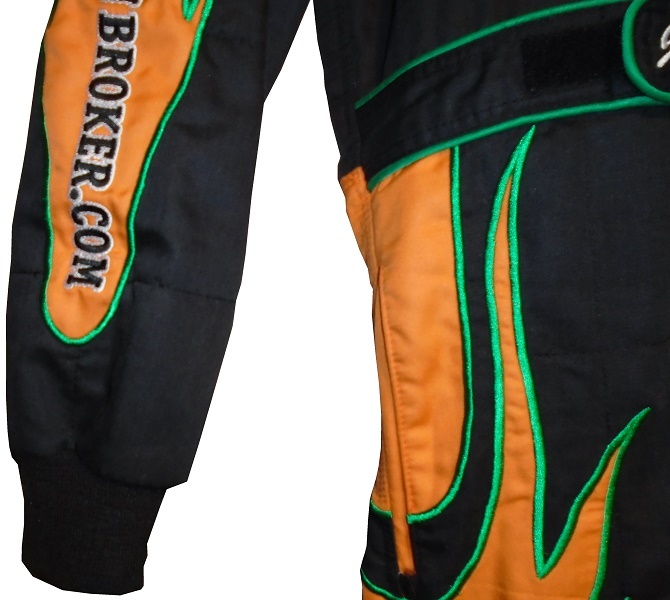 The black legs have orange flames with GUN BROKER logos in television position. The cuffs are boot cuts, with elastic loops on them. 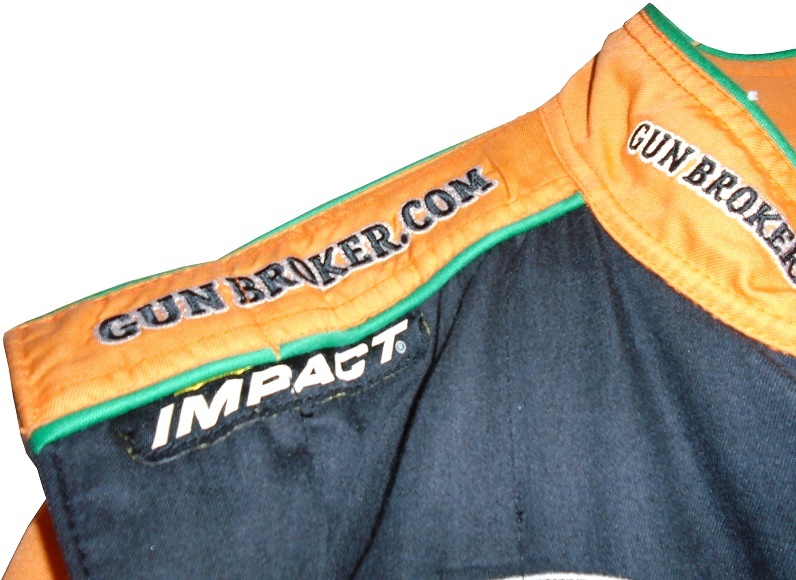 The orange shoulder epaulets are outlined in green, and have GUNBROKER.COM logos embroidered, along with IMPACT logos. 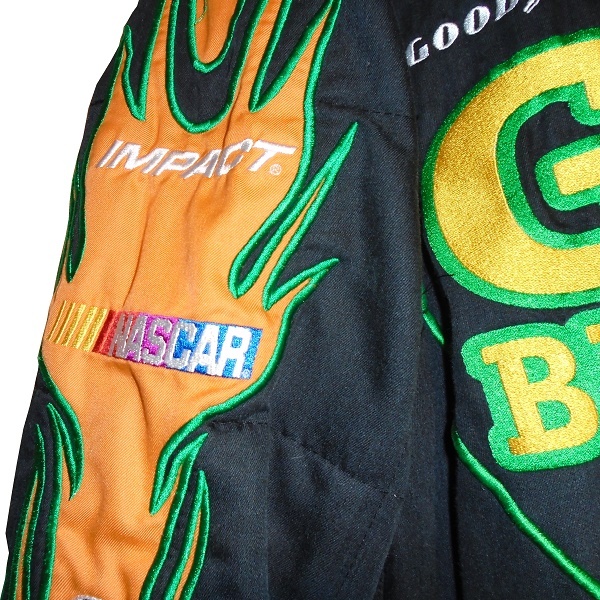 The sleeves have orange flames with IMPACT!, NASCAR logos on the top, and GUNBROKER.COM logos in television position. 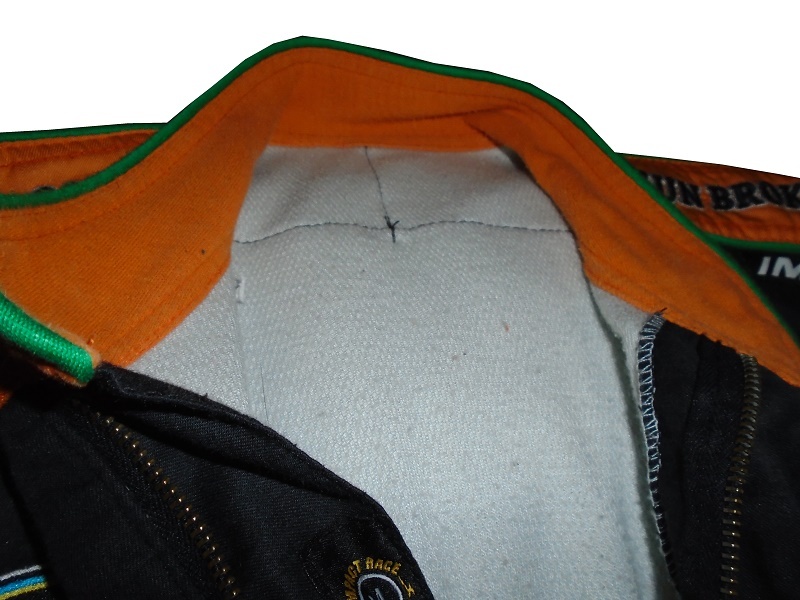 The back of the suit shows some light use. The back of the orange neck is unadorned. 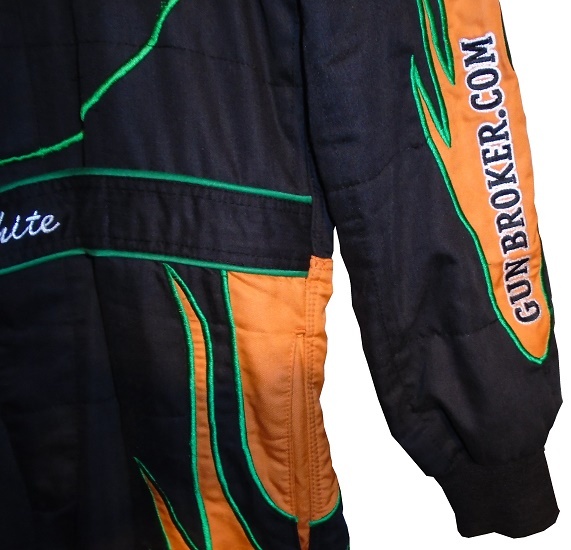 The back of the suit features a green and yellow GUN BROKER logo embroidered in the black material. Jason White retired from driving not long after his final race, and has transitioned into a different racing role. Hopefully he will stay in racing, and will have a long career. Next week, some casino memorabilia.